Worth Articles/News from Outside Sources. The Oracle of Omaha’s Simple But Sensible Gems Can Make You A Better Investor In Any Economic Climate. Warren Edward Buffett (83) is widely considered to be the most successful investor of our times. His investment successes, particularly in buying undervalued companies whose stocks shortly began to rise, made him extremely rich and gained him sobriquets like ‘Sage of Omaha’, and ‘Oracle of Omaha’. Once someone asked Buffet his secrets of investing success over so many years. His reply was, “We simply attempt to be fearful when others are greedy and to be greedy only when others are fearful.” One example is that of Buffett’s decision to invest $5 billion of Berkshire Hathaway’s funds in Wall Street financial giant Goldman Sachs in September 2008, at the height of the sub-prime induced global financial crisis. At that time, Goldman was in dire need of money and by investing $5 billion in the then struggling giant, Buffett eventually ended up generating a return, by some estimates, of about 64% for Berkshire. For all investors, there is a lesson from Buffett’s Goldman deal. “In today’s scenario, it takes great courage to invest in assets like equity or gold…at a time when the markets are correcting with increased frequency. But it is the right approach and will yield great dividends when the tide turns,” says Sanjay Mehta. Over the years, Buffett has given us very simple yet priceless advice, which if followed by investors, are expected to yield handsome rewards over the long term. Here are a few gems from the Sage of Omaha, and what they mean for common investors, as explained by Mukund Seshadri (MS) and Sanjay Mehta (SM). “Should you find yourself in a chronically leaking boat, energy devoted to changing vessels is likely to be more productive than energy devoted in patching leaks. The celebrated investor is also a leading philanthropist. In June 2006, Buffett announced that he would donate nearly all his wealth to charity, committing most of the same (about $31 billion) to the Bill & Melinda Gates Foundation. This donation turned out to be one of the largest acts of charity in the US as well as globally. Have you just got a job abroad or are you planning to migrate for some years? In the tizzy of completing the paperwork, packing and taking care of a hundred different things, it’s easy to forget an important errand—financial tasks. So, after acquiring the job offer letter and visa, and before you hop on to your flight, remember to complete your financial chores. This is because your status will change to a non-resident Indian and this will impact how you bank, invest or pay tax. Here’s a list of things you need to do. Changing your bank account is crucial. Once you are an NRI, you cannot hold a regular savings bank account in India. Sanjay Nair, head, NRI Services, HSBC India, says, "An NRI will require a non-resident external ( NRE) account. Credits to this account can be through remittances from overseas or foreign currency deposits. The NRI’s existing accounts will be converted to non-resident ordinary (NRO) accounts, wherein he can deposit his earnings in India, such as rental income, pension, etc." You can request the bank to retain the same account number, which will save you the hassle of notifying various agencies about the change. Some banks also provide additional facilities. For instance, HSBC offers Premier Assist to its NRI customers, which includes property rental assistance, airport lounge access and emergency hospitalisation. However, the minimum account balance in such cases is high. "To avail of these benefits, you need to maintain a total balance of Rs 25 lakh on a quarterly basis," says Nair. You will need to close other bank accounts as these will become inactive if you don’t use them for a year, and dormant after 6-12 months of being inactive. "Many people don’t close the accounts through which their insurance premium and EMIs are paid. However, this isn’t allowed and they may have to pay a fine," says Sandeep Shanbhag, director at investment advisory, Wonderland Consultants. As an NRI, you can continue to service a home loan. However, you may need to give fresh post-dated cheques or if the EMI goes through ECS, you will have to route it through your NRO account. Also, register for receiving e-alerts and loan account statements through Net banking. This will allow you to know the principal and the interest portion paid when you file your tax returns abroad. If you want to continue to trade in India, you will need to open a PINS account with the depository participant (DP). However, you will not be eligible to invest in all instruments, such as the Public Provident Fund, small savings or certain shares (which are listed by the RBI). "When you change the status to NRI with the DP (share broker), you need to distinguish between shares that can be repatriated and those that cannot. For this, you will need permission from the depository (NDSL/CDSL) and separate accounts," says Shanbhag. Adds Vivek Rege, a financial adviser: "The non-repatriable securities will be linked to the NRO bank account and you’ll be able to withdraw up to $1 million (Rs 4.92 crore) from it." If you are not going to use your demat account while abroad, you can freeze it. While it will continue to receive credits, such as bonus shares and dividends, the transactions will be blocked till you give written permission. If you do not want to freeze the entire account, you can do so for a select number of stocks. In the case of mutual fund investments, you will have to fill up a know your customer (KYC) form, mentioning the change in your residency status as well as the bank account number, so that the SIP debits take place from your NRO account. 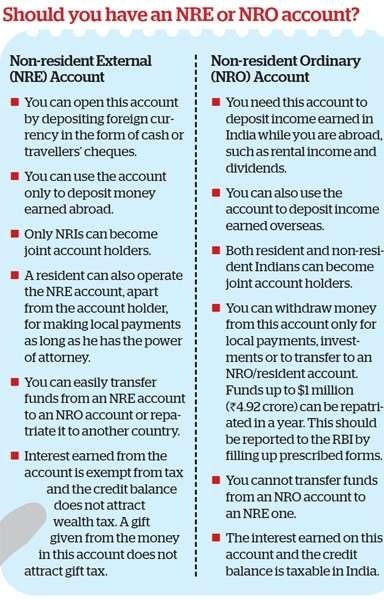 "If you do not inform the mutual fund house about this, you may suffer a loss as SIPs for NRIs cannot be debited from resident savings bank accounts," says Rege. If you own a house, where you’ve kept valuables, you should buy a home insurance policy. "Home/home contents insurance policies have to be renewed annually, so you need to keep track of this. You can take these policies even if the house is given on rent," says Amarnath Anantanarayanan, CEO, Bharti AXA General Insurance Company. In the case of life covers, most insurers do not offer term plans to NRIs, so you could take an endowment plan or a Ulip. Another important insurance need is mediclaim. "If you already own a health plan, you should not close it unless you are sure that you will never come back. However, keep in mind that claims are not met for hospitalisation abroad," says Rege. This might tempt you to discontinue the policy, but Rege suggests, "You must consider the age at which you return and whether any insurer will provide a cover at that age. If you are in the older age group, it may charge a high premium." If you want a family member or financial adviser to manage things when you are not around, you will have to provide them the power of attorney. "A limited power of attorney for specific transactions should be registered. For instance, if you want to rent out a flat, you can nominate someone to operate the bank account for handling the rental income," says Rege. However, a power of attorney can only be used to handle existing accounts or investments, not to open new ones. Before leaving, you will need a certificate from a chartered accountant stating that ‘no taxes are pending’. Ensure that you also have a permanent account number, for you will need to pay tax when you redeem certain investments. While the mutual fund or DP will intimate you via a letter, you may not be able to collect the TDS certificate. However, it is essential to know who has cut taxes. "Registering for the annual tax statement or Form 26 AS, which reflects all the taxes paid cut from your income or paid by you, is essential," says Rege. This can be done online through the NSDL Website of (tin-nsdl.com). While the recommendation of the parliamentary standing committee reviewing the Pension Fund Regulatory and Development Authority Bill, 2011, (PFRDA Bill, 2011) to cap the foreign direct investment limit to 26% has been the most discussed, other recommendations that evaluate the structure of the New Pension System (NPS), too, need some attention. These recommendations are aimed at driving growth, finding more takers for NPS and making it more investor friendly. In the two years of its existence, NPS has found only around 53,954 investors. But in doing so, the recommendations have tinkered with the spirit of NPS. And this has become a matter of concern for the experts who worked on the NPS structure initially. Here are key recommendations relating to NPS and how they would affect the product. For this purpose, the committee has proposed to peg the minimum rate of return on EPF’s rate of return. EPF gave 9.5% for FY11 due to a windfall gain; it had been giving 8.5% for about four previous years. EPF invests only in debt products and the rate of return once declared is guaranteed for the year. However, the structure of NPS is different from that of EPF. Under NPS, investors from the unorganized sector can choose among three fund options: equity (E), fixed-income instruments other than government securities (C) and government securities (G). However, you can invest only up to 50% of the funds in the equity option. You can either allocate the percentage of investment in the three investments yourself (active choice) or let the fund allocate it for you in accordance to your age (auto choice). It automatically begins with a maximum exposure to equity at 50% till the age of 35 years and reduces it to 10% by age 55 in order to lend stability to your investment as you near maturity. However, for government employees, who have switched to NPS, the cap on equity exposure is 15%, on government securities 55% and on other fixed instruments 40%. The present structure of NPS is such that it allows an investor to enjoy market-linked returns while limiting equity exposure. Having a minimum guarantee on returns will affect the fabric of NPS and will increase the burden on the government that promises to meet any shortfall if the fund managers are not able to meet the minimum return criteria. Says Dhirendra Swarup, chairman of Financial Planning Standards Board India and former chairman of PFRDA: “The provision for a guaranteed return which should not be less than the interest paid on EPF alters the basic structure of the NPS. It tantamounts to a partial return to a defined benefit pension as against the original intention of a pure defined contribution scheme. Under the Tier-I account, the subscriber needs to invest every year till he turns 60 years of age. At 60, the investor can take up to 60% of the maturity corpus as lump sum, but mandatorily needs to buy an annuity—a pension product that gives periodic stream of income—with the remainder. The system discourages early withdrawals—before age 60, only 20% of the corpus can be withdrawn as lump sum and the remaining buys an annuity. The Tier-II account, however, works like a savings account and allows unlimited withdrawals. Tier-II can be opened by investors of Tier-I account. While the PFRDA Bill may go in for further deliberations, NPS remains a good investment vehicle for retirement savings if you are a conservative or a medium risk investor. Banks and other intermediaries who provide access to the National Pension System may now be a bit more forthcoming in opening pension accounts. The panel, headed by GN Bajpai, looking into revitalizing the National Pension System has recommended that these entities be paid a commission of up to 0.5% of the investment. In an interview with TOI, Bajpai speaks on why the product, despite being the best for retirement savings, needs to be pushed. The panel has said that financial products have to be pushed. Any financial product in India has to be sold as nobody queues up for buying any financial insurance product. Have you seen anybody queuing up to buy insurance or mutual funds? That is the ethos of this country. The NPS is a wonderful product, it is the equivalent of pure desi ghee and we have not tampered with the product at all. But it still has to be pushed. Pension is a time bomb which is ticking in Indian society. Without protection, retirees will ultimately become dependent on society. Your recommendation for ad valorem charges comes at a time when markets like UK are moving away from commissions. In UK and the West, pension has become a pull product because of the level of financial literacy. But the mindset of Indian society is different and people do not want to think about these requirements. I am talking about the mindset today which may change tomorrow. What will be the impact of revised charges on investors’ savings? The impact would be that those who make low contribution will be better off. Even for those who pay more it is not that the sky is the limit in respect of charges – there is a limit in absolute terms. Today, there are some commentators who feel that system is loaded in favour of the rich because in percentage terms the smaller investors are paying more in terms of charges. When you talk about financial inclusion, do you mean to say that a pension plan should be opened with every bank account? On financial inclusion there is a lot of publicity going around. But when they talk about banking products, they should also be taking about pension and insurance. Living too long is a serious threat to Indians because we have not made adequate provisions. We have always worried about dying too soon but have not made preparations for living too long. Ultimately, why do you want a bank account? It is to park your surplus funds. Will extending the government scheme to contribute Rs 1,000 into every small investors account not put pressure on the Centre’s finances? If you start expenditure for this, it is actually an investment because money goes straight into the account of the pensioner. Secondly, there is zero leakage because the money cannot be spent and it goes into investment which, in turn, will have a spill over effects. We are not saying that it should go on for ever. It can be reviewed later. What changes have you proposed for the PFRDA? Basically, PFRDA will have to build more regulatory capacity. When you have eight or nine fund managers with Rs 10,000 crore it may not matter. But tomorrow when this goes to Rs 1 lakh crore with many more fund managers, a different regulatory capacity would be required. Gold prices have been on a roll over the past few years. The precio US metal has given a return of about 160% in the past five years. That is, if you had invested rupee 100 in gold back then, it would be worth around rupee 260 today. Now, compare that to the investment made in the stock market during the same period. The 50-share NSE Nifty Index, which is a broad representation of the Indian stock market, has grown by around 83%, which means that rupee 100 invested in the stock market five years ago would have grown to rupee 183 by now. The point is: return from gold has been almost double than from stocks. But that, as they say, is the past. What about the future? Will gold continue to perform as well as it has in the past? The answer is most likely yes. Gold prices will continue to rise even further in the days to come. Here are some reasons why. CENTRAL BANKS BUYING GOLD For many years, central banks around the world have been net sellers of gold. But in 2010, after a very long period, they became buyers again. "Central banks have been net buyers of gold in 2010 for the first time in the past 21 years," says Devendra Nevgi, founder & principal partner, Delta Global Partners. In 2010, central banks bought nearly 76 tonnes of gold. This trend further accentuated in the first quarter of 2011, when central banks were net buyers of gold to the extent of 129 tonnes. Central banks were selling gold for a while, reaching a peak sale of 674 tonnes in 2005. "The current purchases are a reversal of that trend – a case of sell low, buy high (a curious recipe for gain with public money! )," remarks Satyajit Das, a world-renowned derivatives expert, and the author of the soon-to-be-released Extreme Money: The Masters of the Universe and the Cult of Risk. WHY THE TURNAROUND Over the years, the central banks have had a major portion of their reserves in US dollar, with a minor portion in other currencies like euro and yen. This trend is now changing. As Ritesh Jain, head of investments, Canara Robeco Asset Management, explains: "The rise in gold prices has caught the eye of various central banks who believe it is a welcome addition to their reserves given its status as ‘store of wealth’ even during periods of crisis. Thus, the central banks have indicated their preference to hold gold over a depreciating asset (read US Dollar)." Most of the bigger economies around the world have been printing currency big time to revive their moribund economies and also to pay off the loads of debt they have accumulated. This has led to a threat of paper currencies collapsing and, hence, the flight to the "safety" of gold. "There is concern over the major reserve currencies like the dollar, euro and yen," says Das. "The only way for the over-indebted western economies to get out of the mess is to print more money," says Jain. "Since gold cannot be printed or mined that fast, the value of currencies is sinking against gold." This means the price of gold is rising. China’s foreign exchange reserves currently stand at $3 trillion and gold as a percentage of these reserves forms only a miniscule 1.8%. But this dependence on the dollar is gradually coming down. "Countries like China who are amongst the largest holders of US dollars are, in fact, diversifying away from the dollar by selling dollar and buying gold," explains Jain of Canara Robeco. As a recent report titled In Gold We Trust, brought out by Standard Chartered, points out: "Currently, 1.8% of China’s forex reserves is in gold; if China were to bring this percentage in line with the global average of 11%, it would have to buy another 6,000 tonnes of gold, or more than two years’ global mine production (of gold)." Imagine what that would do to the price of gold. This is also true of other major holders of foreign exchange reserves like Japan as well as India. Japan’s gold reserves stand at a miniscule 3.2% of its total foreign exchange reserves of $1.14 trillion. India’s gold reserves at 8.2% are much closer to the world average of 11%. Over the past 20-odd years, the supply of gold has been growing at the rate of 0.7%. The main reason for this has been the decline of South Africa as a major supplier. As the Standard Chartered report says: "A very important driver of the slow production growth was the dramatic decline of South Africa (as a producer),which produced about 1,000 tonnes in 1970, but below 200 tonnes last year (ie, 2010)." The supply is likely to remain tight as very few large gold mines are expected to come up. Over the next five years, only seven gold mines that are capable of producing more than 500koz (1 oz =31.1 grams) are expected. Also, gold mines have a high lead time and take time to set up. As the report points out: "According to a study conducted by MinEx, the average lead time for the 214 greenfield projects in 1970-2003 was about 5.4 years in Australia, Canada, and the US, and 8.3 years for other countries." Also, as explained above, central banks, which were major suppliers of gold, have now turned buyers. This means a lot of supply of gold will come from scrap sales. As Nevgi explains: "Supply mainly comes from mines and recycled scrap; there is no central bank sale happening now. The scrap supply though tends to be more price sensitive. Since the demand-supply situation remains tight, any incre-mental new demand for investments or from China would take the prices higher." Due to these reasons, the supply of gold will be lower than the demand over the next five years. Even if the demand remains flat for the next five years, there is likely to be a supply deficit of 665 tonnes, the Standard Chartered report says. This clearly will lead to a higher price. The rise in the price of gold has shown an almost one-to-one correlation with the rise in incomes in China and India (as can be seen from the accompanying table). While Indians have been traditional buyers of gold, the Chinese have been fast catching up. "India and China continued to provide the bulk of the demand as they contributed to more than 1/3rd of the entire demand in the first quarter primarily on account of rising inflation," says Jain. "Another key statistic which came out was that the annual gold demand in 2010 from China crossed the 700-tonne mark for the first time." WHERE ARE GOLD PRICES HEADED? "I can only quote JP Morgan and say ‘it will fluctuate’," says Das. Nevgi feels gold has the potential to easily rise above $1,600 per ounce (or about .`23,200 per 10 grams) or more in the medium term. Jain is more optimistic. He feels that gold prices will continue to accelerate over the next 4-5 years and will enter the last phase of bull run from 2012. "After a period of consolidation and sideways movement in the $1,400-$1,500 band, gold will break out to $1,700 per ounce (.`24,600 per 10 grams) before the end of this year. Gold prices are set to surge to $2,000 per ounce (.`28,900 per 10 grams) by 2012 and $3,000 per ounce (.`43,400 per 10 grams) by 2015," he says. The acquisition of Patni Compu­ters by Nasdaq-listed iGate last week followed a trend — investors dumped the stock fearing that iGate was buying a company larger than itself, besides saddling itself with huge debt. While iGate lost nearly 20 per cent shares in two days, shares of Patni too fell. Whenever a listed company announces a big-ticket acquisition, the stock tends to fall due to concerns of stretched financials and huge debt burdens involved in funding takeovers on their balance sheets. But, this also allows smart inves-tors to go for bargain buys. So, as an investor, is it a good idea to invest in these stocks, when they fall with the expectation that they will gain later? For big-ticket acquisitions, it is believed that it would result in a huge debt burden on balance sheets of Indian acquirers and hence, were perceived as investor-unfriendly. FC Invest spoke to experts, who said that investors can take a bet on stocks of good companies, which would help them judge the execution strategy for a successful integration that would be beneficial in the long run. We look at some of the mega acquisitions by Indian companies and analyse how their stocks performed. Shares of Tata Steel took a beating after it announced a $12-billion offer to buy Anglo-Dutch steelmaker Co­rus Group in January 2007. The process of acquisition concluded only after nine rounds of bidding. After the deal, the shares ended down 9 per cent at Rs 463.95 as investors felt the company was paying too high a price and the purchase could strain the finances at least for the short term. The acquisition was funded by more debt and cash. Eventually, after the deal, the shares were under constant pressure and going into 2008, when the financial crisis and global recession took centrestage, the stock plunged to Rs 216.85 by the end of the year. As the economy improved in 2009, th­ings looked good and the stock boun­ced back and closed at Rs 617.60 by the end of 2009, up 184 per cent. Similarly, the announcement in 2007 that Hindalco was buying Canada’s Novelis for $6 billion in 2007, resulted in the stock plunging to Rs 172-levels, after the acquisition. The stock closed at Rs 51.65 in 2008. The deal also involved a debt component of $2.4 billion. As the commodity boom returned, Hindalco shares closed at Rs 160.75, after the merger. Tata Motors had bought Jaguar Land Rover (JLR) for $2.3 billion in March 2008. Two months before the acquisition, the company had a market capitalisation of Rs 24,000 crore. Five months after the deal, it had plunged to Rs 6,500 crore. The stock plunged from Rs 705.12 in March 2008 to Rs 344 in September 2008. Tata Motors’ market cap has now moved up to Rs 74,618.34 crore, more than 10 times its bottom in 2009. The stock hit Rs 1,381.40 in December, before slipping to Rs 1,178 on Friday. These examples show investors who held on, or those who bought at the low price are now reaping rich dividends. “All these deals were done when the market was at its peak and so the valuation was viewed as costly. Also, the acquisitions are initially dil­utive to earnings and these were big-ticket acquisitions, which burdened the balance sheets. However, these companies have scored because of their execution strategies and a successful integration has helped them regain lost value. So, one should look at the execution skills of the company before making a ‘buy’ call on stocks, which are down after a deal is announced,” Jagannadham Thunu­gun­tla, equity head of SMC Capital, said. Last year, Bharti Airtel agreed to buy the African assets of Zain for $9 billion in cash in the second- biggest overseas acquisition by an Indian company. In its third attempt to expand in Africa, New Delhi-based Bharti, also inherited $1.7 billion of Zain’s debt. After the deal, the company’s shares were hovering around Rs 310.95 and plunged to Rs 293.53. But slowly, investors started to see value in the deal and the stock is now trading at Rs 342.70. “If you look at the acquisitions, most of the targets where loss-making companies operating in a troubled environment. In addition, the debt portion involved in many deals, caused a knee-jerk reaction after the deal was announced. But it tends to subside once the company gets into the integration mode and starts to realise benefit from the acquisition. In case of companies, with a proven track record, if the stock falls over 15 per cent on an acquisition announcement, it is a good time to accumulate,” Vivek Karwa of Chennai-based financial advisory firm Vridhi said. “It all comes to the final execution in terms of big-ticket acquisitions. You see these targets meaningfully contributing to the earnings in the long term, which is also reflected in the share prices. So, the track record of the company matters when it comes to taking a ‘buy’ call,” Alex Matthew, head of research at Geojit BNP Paribas Financial Services, said.